Princess Fiona has arrived!! Leaving Shrek back at the swamp; she has made her annual trek to Cambodia. This vivacious Kiwi has found a way to use her creative and artistic expression whilst contributing to the lives of those less fortunate. Paua Flowers is an outlet which provides funding for her humanitarian cause, Flowers for Cambodia. Apart from her fund raising efforts in her native country, she has created an accessory item made from the local paua shell (whose distinct color is only found in New Zealand). 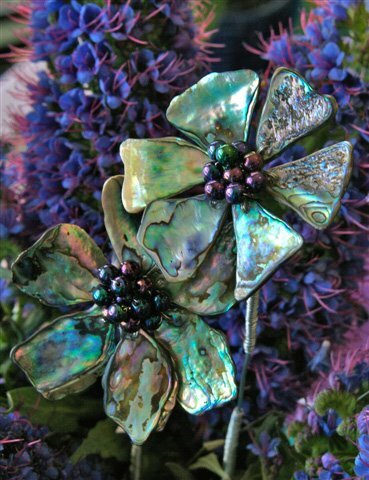 Her items, Paua Flower's, have found a place in the New Zealand tourist market sporting an upper level price; which is possible because of its original artistic design as well as the fact that they are produced entirely in that country and at this time, handmade by Fiona herself. Fiona is able to spend around a month at Wat Opotteaching her skills and encouraging the children to find their artistic side. There is no wrong way for the beginners; and the smiles of confidence are evident. The money Fiona raises buys most of the resource materials such as wire and tools. The beads have been donated by another organization Fiona set up called Donate a Bead, which offers a non-monetary way for people to give. When Fiona arrived this year, she realized that the money making potential of children’s jewelry was one aspect of the project, but as she watched their creativity pour forth through their own creations, another idea arose. Not only could Wat Opot’s jewelry project become self sufficient – the money made going towards the children’s education fund - the inner growth and confidence the kids would experience through their own creative expression was a perfect foundation for art therapy. Before anything could happen, first on the agenda, was to put some of the funds to use to personalize a space that the children could identify as an arts and crafts room. This consisted of a fresh coat of paint in an airy sea green color. Not only were the children involved in the painting, but a monk from the adjacent Wat stopped by for an afternoon of help. After the paint was dry, the room was arranged and supplies were brought out of storage from the previous year as well as the new materials Fiona brought were sorted through. It didn’t take long before supplies were organized and the room was ready for business. And quickly thereafter, the children were diving into the beads and stringing them in a frenzy!